I’ve followed S.M. Amadae‘s work for several years. Her 2016 book Prisoners of Reason informs Chapter 1 of my PhD on theory-building in strategic culture. Now, I’m reading her 1999 PhD dissertation from the University of California Berkeley on the 1944-85 history of rational choice theory. I know that rational choice frameworks have influenced Jack Snyder’s later work and Martha Crenshaw’s analysis of terrorist organisations. I also note that Amadae thanks Philip Mirowski in her acknowledgments. Amadae and Mirowski’s work are writing models for possible future research. For example, it may be possible to write a similar history of strategic culture research that goes beyond Alastair Iain Johnston’s influential generations framework. I missed the Saturday sale of political science publishers at ISA 2014. 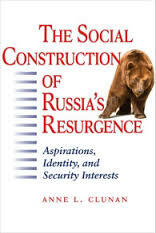 One of the books on my post-conference reading list is Anne L. Clunan‘s book The Construction of Russia’s Resurgence (John Hopkins University Press, 2009). Jack Snyder‘s original paper for RAND in 1977 focused on Soviet strategic culture and the socialisation of politico-military elites during nuclear detente negotiations (PDF). Clunan’s book looks like a useful social construction approach to contemporary issues of leadership and national image that Snyder, Colin S. Gray, Ken Booth and others explored in the first generation of strategic culture scholarship.